jon01, I'm not so sure it has anything to do with the airport change but more to do with shortage of aircraft equipment. Surprise surprise Air India have extended the closure of the routes. I'd be surprised to see them back anytime soon. Just 3 scheduled long haul routes and destinations left at BHX S19 - Dubai, Doha and Islamabad. Where next for long haul at BHX? Answers on back of a postage stamp please! The way I read the AI situation is that they have suspended DEL-BHX until the end of April, and ATQ until the end of June. That shows a very clear intention to return to BHX. It would have been much easier to have suspended the routes, then quietly dropped them, which they clearly haven't done. Turkmenistan have been banned by the EU on safety grounds. Surely when they have sorted out those issues they will be back, they have been a fixture at BHX for donkey's years and especially were AI to really kill off ATQ from BHX would come back stronger. Turkish have been a victim of the 737MAX debacle, and again there is no sign of them drastically cutting back, they had planned to return to twice daily. What I am saying that it's easy to be depressed by recent events, but AI is geopolitical situation, Turkmenistan a technical issue, and Turkish again a safety thing. All, I feel sure will be back. When all is said and done, BHX has a deal more long haul than most UK airports, and definetely airports that are so close to LHR and MAN. If our "leaders" continue to play canute and / or fiddle while Rome is burning, BHX and many other UK airports could have much more to worry about that temporary suspensions of long haul routes. Pakistani airspace reopened and Air India Delhi bookable from Sunday 3 days a week. Not so confident re Amritsar as that stays canned until 30 June but maybe AI are not so confident about the airspace that far north. Jet and AI Delhi Heathrow today still avoided Pakistani airspace but I suppose it will take a few days to get back to normal but plenty of other airlines are well and truly using it. Last edited by jon01; 2nd Apr 2019 at 17:23. I flew on KL from Bangkok yesterday and that flight diverted to avoid Pakistani airspace. Today’s Qatar is A359 ....pretty sure a first visit of this type & only time not a Dreamliner? So are Flybe pulling out of charters because of all the changes happening with the company and Jet2 taking advantage? Credits: CAA for the monthly provisional passenger figures. 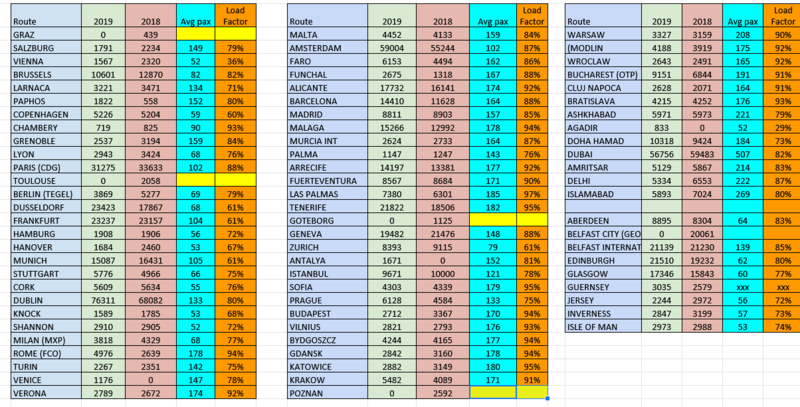 Number of rotations: my own records and FR24 paid subscription and load factors - various seat map websites. Note only four routes lost over Feb 2018 but not sure if that is good or bad as the overall list of destinations is average. Obviously these are just estimates base don the above and is only an indication of how the routes are doing. Interesting that of all the 5.000+ pax/month routes DUS (together with OTP) appears to have had the biggest growth with more than 30 per cent more pax - and that it is BHX 5th biggest route after DUB, AMS, DXB and CDG. And that despite Vienna loads being absolutely dire, Laudamotion are joining the fray. Can't see Agadir lasting unless something fundamental changes either. Last edited by jon01; 19th Apr 2019 at 17:36. I think a Wizz Base at BHX would go great guns. Don't forget BHX is one of the most expensive airports to operate from so it would be difficult for a smaller loco to base themselves there. That and the ridiculous £3 for 5 minutes to drop off is not an incentive to fly from BHX these days. I got just as annoyed about those drop off charges when they were only a pound. I got my taxi to drop me off at the International station and I took the free Air-Rail link. I also discovered that taxis from the station were cheaper than from the airport (where they have to pay a surcharge!